ᅟWithin philosophical departments in Europe and North America, the study of contemporary Indian philosophies remains marginal, due to the well-known persisting Euro-American centric conception of philosophy.1 This leads its main exponents to consider ‘philosophy’ synonymous with the tradition originating in Greece and developed mostly in Western Europe and more recently in the Anglophone world. Within (Euro-American-Israeli) Indology or South Asian Studies, Anglophone Indian Philosophy is also largely left aside, partly because it lacks antiquity and partly also because it escapes the raison d’être of the philological study of South Asia, since it does not require a philological analysis focusing on a South Asian language. In (North American) Religious Studies, contemporary Indian philosophy appears less appealing than its Sanskrit counterpart, because the ritual or religious part is less pronounced in it. Thus, contemporary Indian philosophy remains a sort of an orphan. It is too Anglophone and ‘modern’ to be interesting for scholars of the Sanskrit and indigenous South Asia, but remains too ‘alien’ and non-mainstream for Anglophone philosophers outside India. In this connection, it is worth mentioning that just presenting contemporary Indian philosophy as not too alien has proven to be not enough of a solution. In fact, whenever this is attempted, especially within Analytic philosophy, the reactions move from ‘too alien’ to ‘not exotic enough, we have all this.’ In this sense, contemporary Indian philosophy remains ‘alien,’ either for the prejudice of its radical difference or for the disappointment of its alleged familiarity, which becomes a further argument for its exclusion. Even more surprising, Indian academics themselves reproduce these (simplifying) distinctions, and neglect their own contemporary contributions, which are considered either as not ‘proper’ (namely, ‘Western’) philosophical developments or as not ‘classical enough’ (namely not ‘Sanskrit’) to belong to ‘Indian philosophy.’ Considering this persisting disregard of contemporary Indian philosophy, and the difficulties to make it a proper fit for the academic compartments, even in a global world, we (a scholar of Sanskrit philosophy and a scholar of contemporary Anglophone Indian philosophy, both mostly trained in Europe) felt the urgency and necessity to interrogate the definition, the challenges, and the reasons for neglecting contemporary Indian philosophy/ies. This collection of essays originated around the fruitful meeting of its editors and around their stimulating interaction with the other authors. We all had the pleasure to convene in a successful workshop in September 20172 at the University of Vienna (Austria), during which we could engage together in meaningful discussions about what it signifies to do and to study contemporary Indian philosophy. We started by observing that contemporary Indian philosophy is necessarily marked by its ‘postcolonial’ identity and by the transformations this implies. Most directly relevant, it is marked by a widespread instruction in English focusing on ‘Western’ philosophy, reinterpreted in an Indian context, as opposed to a traditional Sanskrit-based learning. This situation, inherited from colonial times, is combined among contemporary Indian philosophers with an awareness of the gap and a reflection on the consequences of colonization on Indian philosophy, characterizing the ‘postcolonial’ era. A first demand for accessing the global academic discourse was formulated by Indian philosophers in terms of similarity to show that Indian philosophy is philosophical, thereby equal to ‘Western’ philosophy. This demand is followed by a search for identity vis-à-vis the local academic discourse in terms of authenticity if Indian philosophy is conceptualized in English. We therefore addressed issues related to the transition from the colonial external influences to the postcolonial internal developments that contribute to characterizing the cultural and linguistic plurality of Indian philosophical traditions. What does it take for philosophy to be ‘contemporary Indian philosophy’? Can this be more than a particular geographical and temporal characterization? Is it enough to be Indian to qualify as an Indian philosopher? Is ‘Indian philosophy’ philosophy done by Indians and/or about Indians? All authors work on philosophers who remained in India, although all but one (Ali, who discussed also Classical Indian philosophers) analyzed the work of Anglophone philosophers, thus showing how much philosophers in India have to offer (although they are often understudied). In so doing, they rehabilitate local thoughts in examining the specificities of the challenges faced by Indian academics, even if these specificities are influenced by a global context. All authors connect these philosophers with issues of contemporary relevance (e.g., to the debate on nationalism, on ethics, on comparativism, or on death). They thus show how contemporary Indian philosophy naturally offers itself as a way to discuss philosophical, political, and ethical issues, although perhaps in a different way than the study of contemporary philosophy in other areas of the world, due to the richness of its pre-contemporary thought and to the history of its struggle as a colonized country. In other words, the diversity of its traditions and conceptual paradigms foster cross-cultural analyses and the development of models of hybridity and cosmopolitanism (as seen, paradigmatically, in the recent work by J. Ganeri). The authors suggest a critical aspect of the ‘postcolonial’ influence (felt as alienation or subjection), either in academics in India or in the centrism of the Euro-American world, which however go together with a creative potential side, in terms of cross-cultural resources and methodologies. More specifically, most authors relate their historical analysis of the thought of one or more authors to the development of Indian philosophy today, also in its academic side (see, e.g., Kirloskar-Steinbach, Miller, and Oinam), thus showing an awareness of the need to come to terms with the colonial predicament discussed above and its postcolonial evolutions. They point at the complexity of a radical rupture that, however, bears traces up till today, and the dilemmas of its understanding. All authors agree that ‘Western’ philosophy is not just an enemy to be forgotten and instead consider the confrontation with it fruitful and unavoidable (see especially Raghuramaraju), although they insist on the need to reconfigure the dialogue (which needs to be not just uni-directional, see Raghuramaraju and Odyniec). The term ‘Western philosophy’ seems to remain for these authors a problematic entity when facing the Other of Indian philosophy/ies: some tend to use ‘Europeanization’ (defining the colonial context at the time of the first encounters), others chose to speak of Euro-American philosophy, extending it to the increasing relation with American philosophies (which, for Anglophone Indian philosophers, are a privileged partner). Most of the authors preferred to use ‘Western philosophy,’ which, although vague, expresses a non-geographical ideological counterpoint to ‘India.’ Although insufficient, these terms seem to indicate the continuing necessity of thinking about a relation between Indian philosophies and non-Indian philosophies and between the philosophies brought by colonization and the native traditions, even if both poles are always mixed and transformed by the relation itself (and therefore, cannot be defined without the other term of the relation). For pragmatic reasons and since we dislike the (at times coward) choice of alphabetic orders, we organized the articles around thematic cores and, within these cores, according to a chronological sequence. The first thematic group includes Nalini Bhushan and Jay L. Garfield, Monika Kirloskar-Steinbach, and Daniel Raveh, who focus on a historico-philosophical analysis of authors of Indian philosophy. Bhushan and Garfield demonstrate how using the political categories elaborated by the Ārya Samāji Congressman and activist Lala Lajpat Rai can elucidate contemporary misunderstandings/misuses of the concept of ‘terrorism’ today (particularly in nationalist ideologies); Kirloskar-Steinbach presents the work of S. Radhakrishnan as a ‘public philosopher’ and his construction of the national identity in philosophy during the colonial time; Raveh contemplates the freedom of death and the readiness to die of exemplary figures such as the Mahatma in dialogue with Ramchandra Gandhi. Then come Pawel Odyniec and Dor Miller’s articles, with a more evident comparative focus (comparativism is even explicitly thematized by K. C. Bhattacharya as discussed in Odyniec). Odyniec analyzes K. C. Bhattacharyya’s subtle confrontative interpretation of Advaita philosophy vis-à-vis German idealism as critically engaging the colonial predicament; Miller reconstructs the philosophical dialogue that never happened between Daya Krishna and Jacques Derrida in a form of comparison malgré soi between the two philosophers, in spite of the heavy criticism that the former addressed to postmodernism. Last, Muzaffar Ali, Bhagat Oinam, and Adluru Raghuramaraju interrogate the topic of contemporary Indian philosophy and push it towards new directions and methodologies. Ali investigates the potential creativity of the Sanskrit rhetoric for contributing to Indian ethics today. Oinam interrogates the difference between philosophy in India and Indian philosophy, and the postcolonial issues for contemporary creativity in Indian academics. Raghuramaraju considers the necessity of thinking anew the comparison and the use of Western philosophers in Indian academics and creates a new methodology of ‘bending’ authors to allow an equal dialogue between Indian and Western authors. Elise Coquereau-Saouma concludes this collection by going back to the themes raised above and discussing reasons for the neglect of contemporary Indian philosophers in the contemporary global discourse. A last formal remark—formal aspects are often not just formal. Deciding to capitalize a word, for instance, is not a neutral decision (‘Renaissance’ indicates a unique phenomenon taking place in Europe in the fifteenth–sixteenth c., whereas ‘renaissance’ could be applied more loosely to comparable phenomena). Similarly, using the italics for the word dharma indicates that one is focusing on the meaning of this foreign word (including, for instance, ‘characteristic’), whereas ‘dharma’ points to the meaning it has acquired in common English (‘religious law’). Therefore, we uniformed lists of references and use of punctuation, but we left each author free to refer to their predecessors and the idea that inspired them as they prefer. Hence, readers will encounter in this issue ‘ahiṃsā’ as well as ‘ahimsa,’ ‘Adi Sankara’ as well as ‘Śaṅkara,’ and so on. For similar reasons, we have not changed the authors’ use of terms such as ‘West’ and ‘Western,’ notwithstanding our reservations against them (as expressed in fn. 1), especially whenever this choice was self-aware and programmatic. The collection of essays in this volume was made possible by the opportunity to meet over a conference on contemporary Indian philosophy that was convened in Vienna, which in turn would not have been possible without the institutional and financial support of the Institute for Philosophy and the Institute for South Asian Studies of the University of Vienna; the Institute for the Cultural and Intellectual History of Asia of the Austrian Academy of Sciences; and the WWTF (Vienna Science and Technology Fund/Wiener Wissenschafts-, Forschungs- und Technologiefonds) Project ‘Reasoning Tools for Deontic logic and Applications to Indian Sacred Texts’ (MA 16_028). We also warmly thank Karin Preisendanz and Georg Stenger for their support; Judith Starecek, Irina Stumpf, and Michael Stadler for their organizational help; the further scholars who participated to the conference and enriched it with their papers and ideas, in particular Sharad Deshpande, Marzenna Jakubczak, Chakravarthi Ram-Prasad, and Anna-Pya Sjödin. We are also grateful to our chairs, i.e., Martin Gaenszle, Alessandro Graheli, Anke Graneß, James Madaio, Cristina Pecchia, and Sonia Weiner, for their contribution to the discussion; to all the authors of this volume, for the diversity of their insights and for their collaboration in the editing process; and to Purushottama Bilimoria and the editorial group at Sophia for generously hosting the proceedings and for their help during the editorial process. Last but not least, gratitude is due to Dania Huber for her help during the copy-editing phase, and to Marco Lauri for reviewing the English form of this introduction. 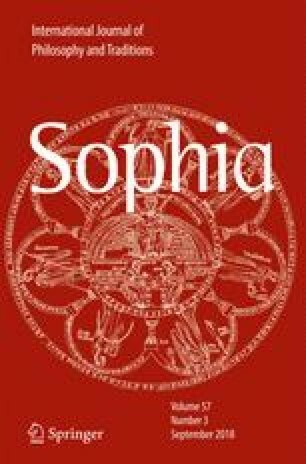 It is our pleasant honour to introduce this collection of essays to the global readers of Sophia. We chose to avoid the terms ‘West’ and ‘Western,’ since they seem to us to be hardly more informative than ‘East’ and ‘Eastern’ and to reflect mostly the prejudices of people who want to aggregate the ‘Other’ in order to identify themselves in contraposition to it. We use instead ‘European and North-American’ in order to refer to the cultural and geographic areas of the world in which cultural and academic institutions have been determined by their European heritage, be they in Europe, North-America, former European colonies, and so on. We did not use the phrase ‘European and Anglophone world’ because contemporary India is very frequently Anglophone, but still its philosophy often continues to be excluded from philosophical discussions. Elisa Freschi’s research for this paper has been enabled by the Vienna Science and Technology Fund/Wiener Wissenschafts-, Forschungs- und Technologiefonds (WWTF MA 16_028). Elise Coquereau-Saouma is a recipient of the Doctoral Fellowship Programme (DOC) of the Austrian Academy of Sciences at the Institute of Philosophy, University of Vienna.